I love your wreaths! …and your entryway as a whole! And I can’t NOT mention your garage doors…so cool! Talk about curb appeal !!! How beautiful. I hate it when I forget to change the name! OOPs! It really looks beautiful. I love the front doors. Shirley, you have such a welcoming entry! 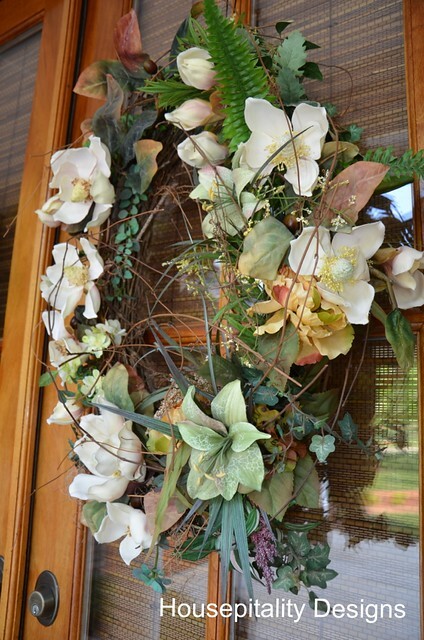 Love your wreaths and all of your porch decor! Everything is just lovely! 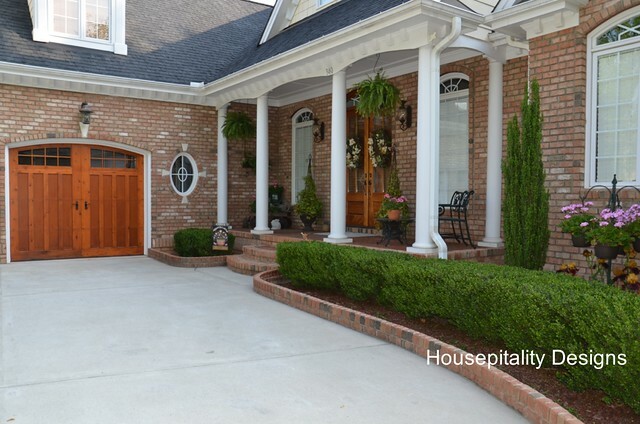 Double doors equal double trouble but they look very welcoming as does the entire front porch. I miss my irises that will be blooming soon at my previous house. But I have peonies here which are just about ready to open, so all is well. Your doors look wonderful! Thanks for the shout out my wonderful friend! 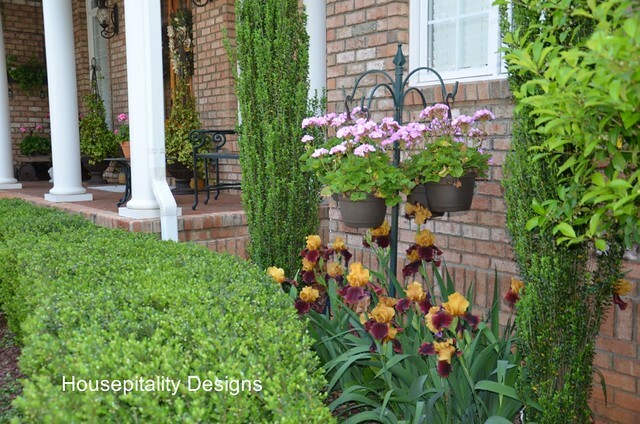 I love that brick edging, too! I would love to have double doors on the front of my house *sigh* …..now if I could just convince my husband to knock down the front entry! hee hee! Hello, Your double door are beautiful. I love your front entrance, the doors, wreathes and the ivy topiaries. I’m visiting from Alison’s Favorites on the First. What, a gorgeous front entrance! Your wreaths look beautiful! Shirley your entrance is beautiful and I love the topiaries you have near your doors! Are they real? 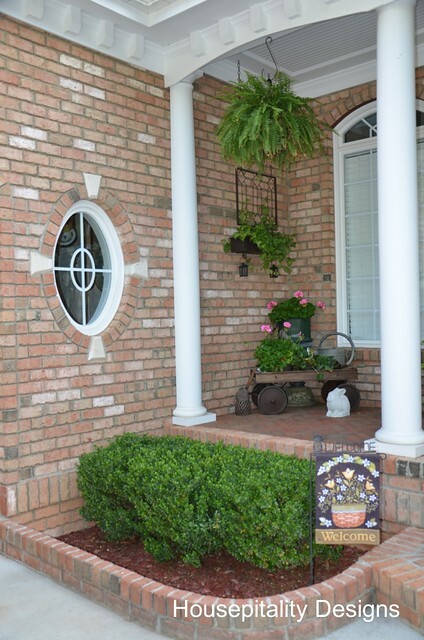 Your front entry has super curb appeal! Very pretty, Shirley! I love double doors! I really like your garage doors, too. I do like the looks of the double doors. Doubley delicious you might say. Your home is lovely and I love the pillars. I have a bit of a pillar fetish. 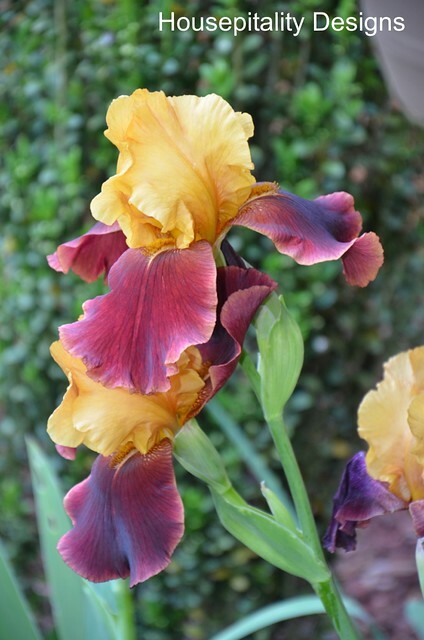 Iris were one of my mothers favorite plants. Because of this they have a soft spot in my heart. I have some that were starts of hers. Mine are just in bud now. Yes, I agree that your whole front porch area is just beautiful! I adore your garage doors….they really add to the ambiance instead of detract (like many garage doors do). I just spotted your pineapple porch light….you do have the pineapples! If the wagon in the corner disappears, don’t ask me if I know where it is! What a pretty house you have Shirley~quite the classic look and the wreaths compliment very nicely~! I really liked the old wagon too. I love double doors at the front of a house – like you said, it’s double the welcome! Your wreaths are really pretty and I love the vintage wagon too! 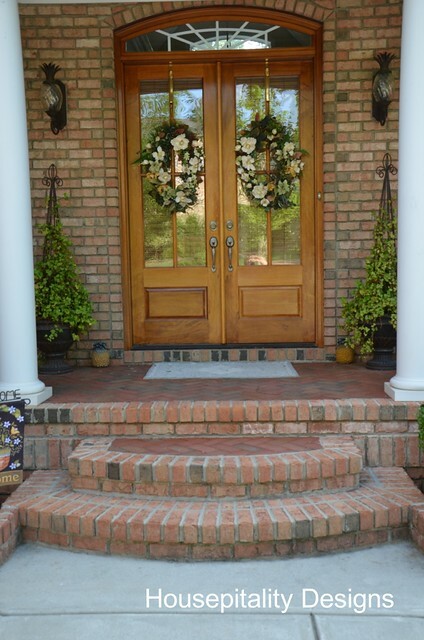 Your front entry to your home is stunning. 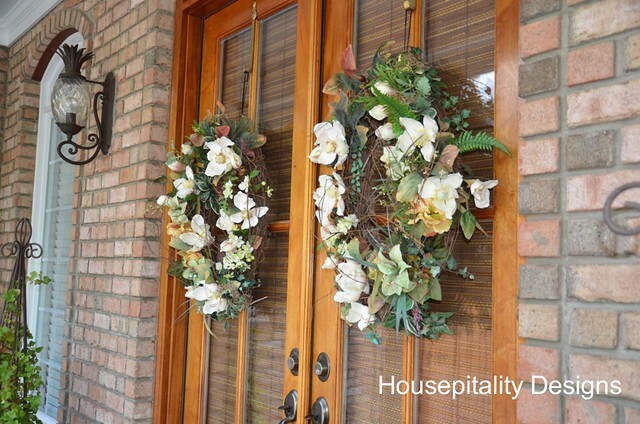 I love the wreaths on your double doors! Your house is a showcase of beauty! Wow, those irises are beautiful. How are you keeping the deer away? I ordered some of the mint Imustgarden.com spray and it works well and smells great. thanks for the tip. 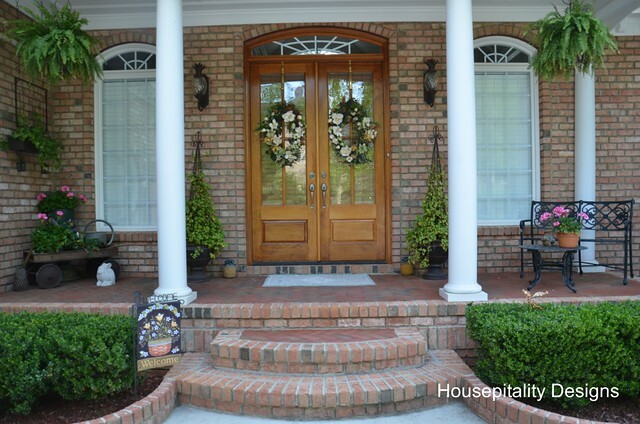 Shirley, I have always loved double doors on a house, and yours are gorgeous with your wreaths. Your irisis are an unusual color, and they are beautiful. I have some in the yard that my mother-in-law planted, but most of them are purple or yellow. If i have to talk about the beauty of the house there is no comparison. You have also clicked nice stills as well. Entrance of the house is reallt awesome.